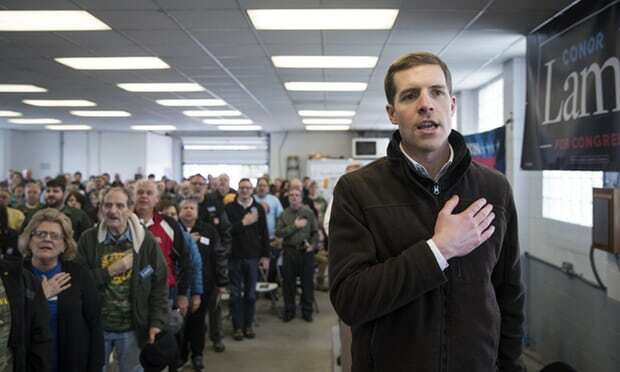 WAYNESBURG, PENNSYLVANIA – On Sunday, former Marine Conor Lamb found himself desperately hiding in the back barn of the Greene County Fairgrounds refusing to answer questions about immigration. The night before, Donald Trump had come to the district to campaign on behalf of Lamb’s opponent, Rick Saccone. Trump’s closing argument centered on immigration and the need to cut off federal funds for so-called “sanctuary cities” that limit their cooperation with ICE. Trump warned the crowd that electing Lamb would lead to even more immigration. “The Democrats are the party of sanctuary cities,” Trump told the crowd. Trump’s anti-immigrant message mirrored the message in millions of dollars worth of TV ads accusing Lamb of supporting “sanctuary cities”, a political position which Lamb actually refused to ever discuss with the press. Throughout his campaign, Lamb refused to answer scores of detailed questions on family reunification policies, sanctuary cities, and the DREAM Act. At one point, Conor Lamb’s brother Coleman Lamb — who is the communication director for Congresswoman Kathleen Rice, a corporate Democrat from Long Island, as well as the unpaid press manager for the Conor Lamb for Congress campaign — even got upset with Payday for asking about immigration. Coleman Lamb accused Payday of asking tough questions about immigration solely because we weren’t getting press access to Conor Lamb. For the first two months of his campaign, Lamb refused to talk to the press. He even held events with former Vice President Joe Biden and Congressman Joe Kennedy III that members of the press were barred from attending. Despite labor’s massive turnout effort on behalf of Lamb against anti-union Republican Rick Saccone, deep tensions remained due to Lamb’s refusal to support $15 an hour and the AFL-CIO’s views on immigration. Tensions that led Lamb to avoid press throughout the campaign including at a Steelworkers’ rally last Friday and a Mine Workers’ rally on Sunday. Last Sunday, two days before the election, Conor Lamb stayed true to his reputation for having an adversarial relationship with the free press. First, he attempted to leave through the front entrance but a gaggle of reporters from outlets had gathered outside. Then, as these reporters attempted to run to the back entrance of the barn, a staffer for Lamb came out. The Lamb staffer promised that the former Marine would be out shortly to answer all questions. After that, members of the press noticed that Lamb was leaving through the back entrance. Yet again, the Lamb campaign had lied to the press. “This is ridiculous,” said NBC News reporter Vaughn Hillyard as his soundman and cameraman struggled to keep up with him in a desperate race to confront Conor Lamb. At the back entrance, Lamb was quickly whisked through a crowd of reporters. His campaign’s public relations staff had deceived the press once more. The following Monday before the election, his campaign refused to tell the press where the candidate was in order to prevent a high-profile repeat of Lamb’s hiding from the press in the back of a barn. Throughout his campaign, Lamb has refused to answer detailed policy questions with his spokespeople refusing more than a dozen requests from Payday Report dating back to last November. In early February, when Lamb’s campaign finally did talk about immigration, their position broke solidly with the position of the AFL-CIO, which has called for passing a clean Dream ACT with no increased funding for the ability of ICE to deport immigrants or increase border security. “Conor has said he supports a legal path to citizenship for Dreamers, and he supports more funding for border security. Most voters agree and don’t see why we can’t have both,”Lamb campaign manager Abby Murphy told Payday. Not only did Lamb fail to support the AFL-CIO’s position on immigration, he also came out against re-electing Pelosi as Speaker of the House if Democrats retake office. Instead, Lamb campaigned with House Minority Whip Steny Hoyer. Hoyer is an elderly corporate Democrat who has a long track record of disappointing labor and immigrants. In contrast, Pelosi has vigorously pushed her caucus and even shut down the government in an attempt to secure passage of a clean Dream Act without additional funding for ICE that could be used to crack down on immigrants. Lamb’s victory tonight could send a troubling message to Democrats that it’s okay to run away from immigrants. Conor Lamb certainly appears to be fine with running away from the press when they ask tough questions about immigration. Be the first to comment on "Lamb’s Victory Sets Precedent on How to Run From Immigrants and the Press"